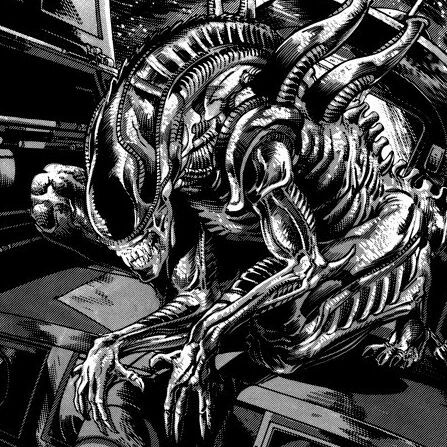 As of today, the 156 pages of unadulterated story are finally available in a gorgeous hardcover edition (there have been printings in the past, but they colorized the original black-and-white artwork or changed the leads’ names to “Wilks” and “Billie” to awkwardly accommodate Alien 3’s continuity). For anyone who loves the Alien saga, it’s a must-have. Part of the magic of Alien and Aliens was the way the two movies used the same toothy, phallic monstrosities to explore different genres. Scott’s masterpiece was a haunted-house story: A group of people are stuck in a claustrophobic structure and fight to survive while a mysterious specter of death picks them off. Cameron’s take was, by contrast, one of the all-time great action movies: A group of hardened soldiers go up against an unrelenting enemy horde with no hope of backup. 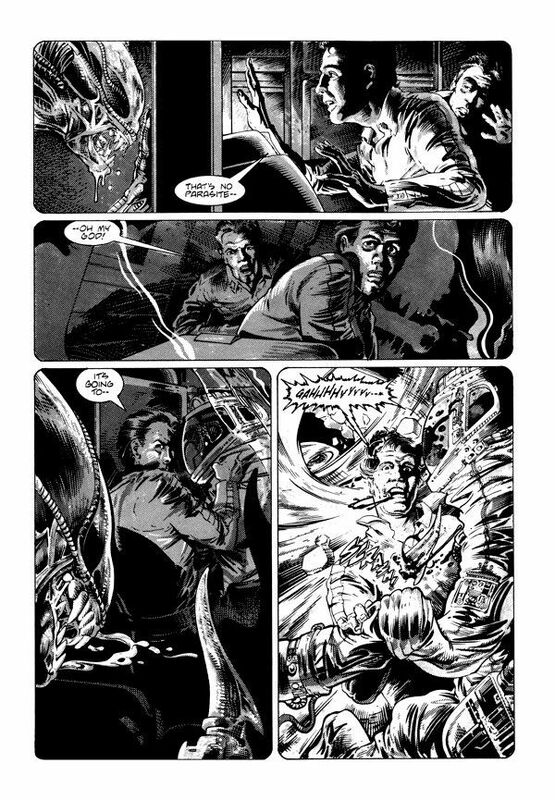 The comic — penned by Mark Verheiden and illustrated by Mark A. Nelson — incorporated yet another genre: Lovecraftian existential horror. Though it borrows its high-tech torturers and sinister corporations from the then-trendy motifs of cyberpunk, its philosophy and structure feel a lot more like At the Mountains of Madness than Blade Runner. The tone and themes are as bleak and terrifying as Nelson’s stunning blacks and whites. The plot details can get a bit wonky, but the basic arc is simple: Hicks and Newt, both suffering from PTSD, find themselves on a mission to the aliens’ homeworld; meanwhile, Earth-based warmongers and religious fanatics rush to embrace the aliens for weapons patents or apocalyptic submission, respectively. Naturally, Murphy’s Law sets in for all of these plot threads and the creatures end up infesting Earth. The process is stretched out and chronicled in agonizing detail: We see humans with alien embryos inside them having horrific nightmares about their mothers being murdered by monsters; we see a montage of a plane passenger, a bikinied beachgoer, and a pleasant grandmother all perishing as aliens burst from their chests; we hear repeatedly that humanity was too craven and self-defeating to ever join together and make a stand. The leader of an alien-worshipping doomsday cult calls the monsters “the immaculate incubation,” and although Hicks and Newt do their best to fight some of them off, they eventually come to that same conclusion: The aliens are blood-curdlingly perfect. Indeed, if there’s a message to the whole story, it’s Lovecraft’s message about Cthulhu, Azathoth, and their otherworldly ilk: Gods are real, and they want to kill you. When Hicks and Newt make it to the homeworld, they encounter a different kind of extraterrestrial, one of the species that piloted the derelict spaceship Ripley et. al. discovered in Alien. Though it’s extremely powerful and fights off some of the swarming creatures, it’s far from benevolent: It sends Newt a harsh telepathic message (“something exploded inside my head, bright like a million suns”) to inform her that it’s going to orbit Earth and simply wait for the aliens to kill off all the humans, at which point it can colonize the planet. The only consolation is companionship, and our two damaged protagonists find it in each other. Their character beats are a little rote: Hicks spends a great deal of time blabbing tirades about corrupt bureaucrats, and Newt gets wrapped up in an extremely abrupt love story. But honestly, the human characters aren’t where the action is — the aesthetics are. Verheiden’s storytelling is ambitiously bleak, Nelson’s visuals are gruesome, and the combination of the two produced a nightmare-fueled comic unlike any other. It’s good to have it back.